Original blind-stamped goatskin, hinges repaired. Purchased on the Herzog Fund, 1984. Original (?) arms obliterated (fol. 20) and overpainted (fol. 28); Leo S. Olschki, Florence (Inv. no. 40641); Herbert Straus; Therese K. Straus. Ms. book of hours for the use of Rome (Hours of the Virgin, Office of the Dead); written and illuminated in France, probably Cambrai, 1490-1500. 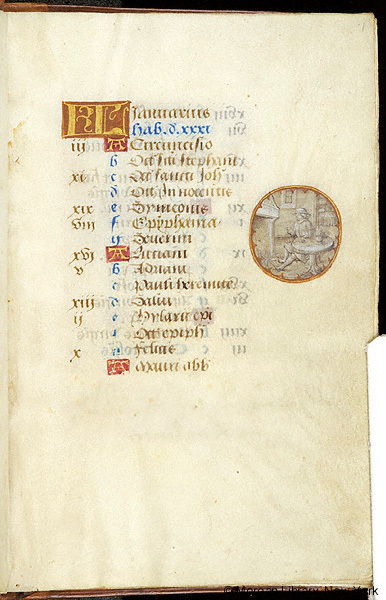 Decoration: 9 large miniatures; 24 small miniatures; 24 calendar roundels (occupations of the months, signs of the zodiac); 1 border historiation (fol. 188); full illuminated borders on pages with large miniatures and on facing text pages; partial illuminated borders on pages with small miniatures, large illuminated initials, and on fol. 188; numerous illuminated initials and line fillers.